One bedroom with a double bed, one roll-a-way/hide-a-way-bed, one baby-bed. The apartment is recommended for 2 people. Linen service, bath kitchen towels, kitchen fully equipped, bathtub with shower, washer and dryer, parking available. Our apologies Brigitte and Thomas for the delay in writing this review. After travelling for 4 months we had so many to do and have only just finished! 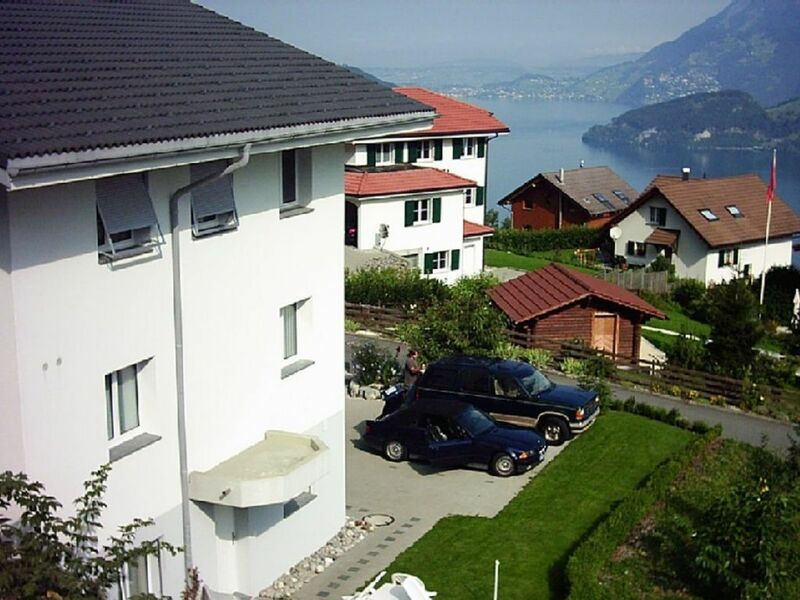 My husband and I stayed in this wonderful apartment for a week on our first visit to Switzerland. What an amazing experience! From our first inquiry the service was excellent. Brigitte was always quick to reply to our many questions. The apartment is the perfect place to stay. It is clean, well maintained and has everything you need for a self catering and very comfortable stay. There is also a patio area that is a wonderful place to sit and enjoy the beautiful views and panorama with a quiet drink. We had the best sleep each night in the large comfortable bed, plenty of hot water for the shower, and heating when needed. The added bonus of a washing machine was great, especially when travelling for a long period of time as we were. A well stocked kitchen made it easy to prepare our own meals each night after a day of exploring. The area is just so picturesque, and there are many villages and towns to explore within an easy drive. The views of the lake from the apartment are fantastic, we spent many hours just sitting and watching the many boats and paragliders passing by. Golf: Engelberg: 30 minutes by car. Ski: Near to several different alps and ski resorts.